New Tollywood Bengali film Durga Sohay story review casting director producer cast of Durga Sohay release date buy tickets online Bengali movie Durga Sohay ticket booking online, Sohini Sarkar & Tonushree Chakraborty in Durga Sohay Bengali movie review shooting location of Durga Sohay, names of all cinema halls showing Durga Sohay in Kolkata, Durgapur, Howrah & West Bengal, show timings of Durga Sohay, Watch online Bengali cinema Durga Sohay of Sohini Sarkar & Tonushree Chakraborty. After the huge success of Byomkesh Bakshi, Bengali filmmaker Arindam Sil is coming up with a family drama film named ‘Durga Sohay’. 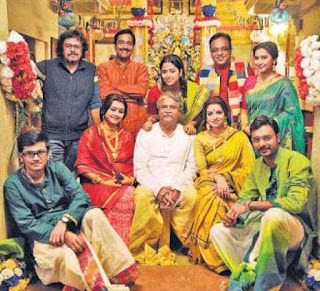 Since, it’s a tale of joint family thus it do have multi-star cast that includes names like Sohini Sarkar, Tanushree Chakraborty, Sampurna Lahiri, Kaushik Sen.
Sohini Sarkar & Tonushree Chakraborty starring Bengali Movie Durga Sohay, directed by renowned film-maker Arindam Sil, is going to release soon. Arindam Sil directed Bangla Cinema Durga Sohay of Sohini Sarkar & Tonushree Chakraborty is a family drama film. 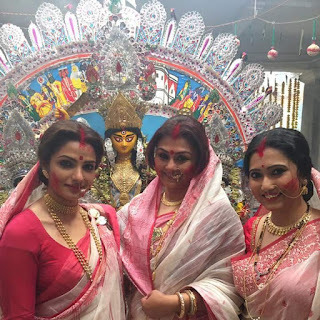 Let’s check out few more details of Durga Sohay Bengali film of Sohini Sarkar & Tonushree Chakraborty now. • Durga Sohay Bengali movie Director Name: - Arindam Sil. • Durga Sohay Bengali film story writer Name: - Sugata Guha and Debalina. • Durga Sohay Bangla Cinema Music Director / Music Composer Name: - Bickram Ghosh. • Durga Sohay Bengali movie Actor & Actresses Name: - Sumanta Mukherjee, Sohini Sarkar, Kaushik Sen, Debjani Chatterjee, Tonushree Chakraborty, Indrasish Roy, Sampurna Lahiri, Anirban Bhattacharya, Rwitobroto Mukherjee and others. • Durga Sohay Bengali film Release Date: - April 2017. • Durga Sohay Bengali Film Story Review: - ‘Durga Sohay’ Bengali film story is of ‘Basak Bari’ headed ‘Somshankar Basak’, who is a jeweler. Somshankar Basak lives with his two sons, daughter and daughter-in-laws as a joint family involving in jewelry making business. Veteran actor Sumanta Mukherjee is playing the role of ‘Somshankar Basak’, actor Kaushik Sen & Indrasish Roy are playing the role of two sons, actress Debjani Chatterjee & Tonushree Chakraborty are playing the characters of daughter-in-laws, actress Sampurna Lahiri is playing the daughter of Somshankar Basak in the film. A sudden health issue of Somshankar Basak brings the character of Sohini Sarkar (Durga) in the house as ‘nurse’. The story revolves around ‘Durga’ who solves the ‘jewelry lost’ case happened during Durga Puja. The shooting of Durga Sohay mostly happened in a North Kolkata based ‘Bonedi Bari’ during December 2016 and January 2017. It’s most likely to release in April month. Cinema Halls showing Durga Sohay Bengali movie: - will be updated soon. • Online Ticket Booking of Durga Sohay: - The Advance Ticket Booking can be done from ticket counters of every Cinema Halls, 2-3 days before. But, you may Book Tickets Online of Durga Sohay www.bookmyshow.com website. Tollywood Bengali film Paanch Adhyay movie story review casting director producer cast of Paanch Adhyay release date book buy tickets online Bengali Paanch Adhyay Dia Mirza & Priyanshu Chatterjee, Paanch Adhyay Dia Mirza & Priyanshu Chatterjee, Bengali movie review plot shooting location cinema halls showing Paanch Adhyay Kolkata Bengal show timings upcoming Bengali cinema Paanch Adhyay watch online details information. Paanch Adhyay Bengali film is going to be remembered for long as it’s the Debut Bengali film of Bollywood Actress Dia Mirza. R.P. Techvision & Shibaji Panja presents the first Bengali film of Dia Mirza Paanch Adhyay, which is going to release on 19th October 2012, under the direction of Pratim D. Gupta. Written & Directed by film-maker Pratim D. Gupta has featured Dia Mirza, Priyanshu Chatterjee, Soumitra Chatterjee, Sampurna Lahiri & others in his ‘Paanch Adhyay’ Bengali cinema. • Paanch Adhyay Bengali movie Director & Story Writer Name: - Pratim D. Gupta. • Paanch Adhyay Bengali movie Producer name: - Kaustav Roy. • Paanch Adhyay Bengali movie Music Director Name: - Shantanu Moitra composed the melodious songs of Paanch Adhyay Bengali film and sung by eminent singers like Shaan, Shreya Ghoshal & others. • Paanch Adhyay Bengali movie Lyricist name: - Anindya-Chandril. • Paanch Adhyay Bengali film Casts Actors Actresses: - Priyanshu Chatterjee, Dia Mirza [as ‘Ishita’], Sampurna Lahiri, Soumitra Chatterjee [as ‘Hrishi Da’], Suman Mukhopadhyay, Anubrata Chatterjee & many others. • Paanch Adhyay Bengali movie Release Date: - 19th October 2012. • Cinema Halls showing Paanch Adhyay Bengali movie: - The premier show of Paanch Adhyay Bengali film will be shown at Priya Cinema hall at 7pm on 19th October 2012 (Release date). Let’s check out few Cinema Hall names showing Paanch Adhyay Bengali film in Kolkata & other areas of West Bengal – Priya, Star, Inox (City Centre, Swabhumi, Rajarhat, Liluah, Burdwan, Durgapur), FAME (Hiland Park & South City), Ajanta (Behala), London Parris (Ballygunje), Jaya (Barasat), Bioscope (Rajarhat), Malancha (Tollygunje), Jayanti (Barrackpore), Laali (Barasat), PVR Cinema (Shalimar, Howrah), Bioscope (Junction Mall), Sanskriti Mancha (Burdwan), Inox (Siliguri 1 & 2), Rupasi (Agartala) and many others. Paanch Adhyay Bengali film is also going to be screened in Mumbai Film Festival on 23rd October 2012 (6pm) at INOX Nariman Point Screen 3 and next day on 24th October 2012 (10:15am) at Cinemax Versova Screen 3. New Bengali movie / Tollywood film Paanch Adhyay of Dia Mirza & Priyanshu Chatterjee seems to be worth watching in Cinema Hall; so start buy tickets online of Paanch Adhyay from www.bookmyshow.com website.